Working with a criminal defense attorney in Statesville, NC can ensure that your reputation is preserved and that justice is ultimately served. When you need a criminal defense attorney, the reason is seldom positive. Excellent legal representation is a key requirement to not only surviving a stressful time as a party in a criminal case, but also to ensuring that the truth is told, your reputation is preserved, and justice is ultimately served. No matter the precise charge or whether the need for a criminal defense attorney stems from a criminal charge, a traffic incident such as a DWI or DUI, or other incident, you need someone in your corner who understands you and your needs and is willing to not only fight for your case, but also to go the extra mile. A criminal defense attorney also benefits from local connections, as these human connections help to assuage the turmoil of pending legal activities and to ensure that everything is done to represent you well. 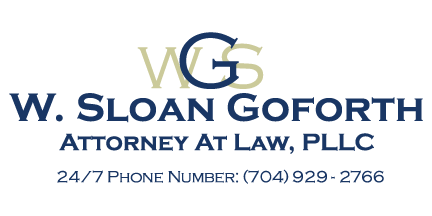 W. Sloan Goforth, Attorney at Law is a native North Carolinian and understands the needs and desires of his neighbors and clients. A former educator, Mr. Goforth has the skills and expertise to help clients and juries understand the nuances of each case, and education is a prime way to help clients understand their legal rights and obligations. Regardless of the exact circumstances of your need for a criminal defense attorney, he knows that understanding the client beyond their present need for his assistance is instrumental in mounting a successful defense and will go the extra mile to ensure that each and every one of his clients has the defense they deserve. Contact our office today to schedule your consultation. At the office of W. Sloan Goforth, Attorney at Law, our criminal defense attorney proudly serves residents of Statesville, Troutman, Taylorsville, Mocksville, Mooresville, Hickory, Iredell County, Alexander County, and Davie County, North Carolina.